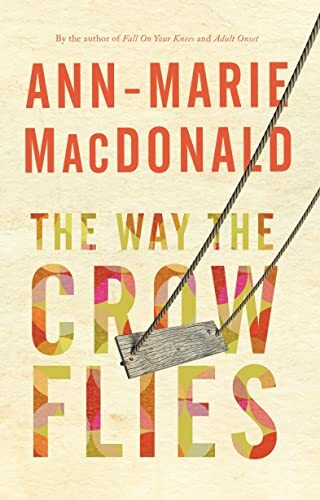 From the back cover: "In "The Way the Crow Flies", Ann-Marie MacDonald takes us back to the early 1960's, a time of optimism infused with the excitement of the space race and overshadowed by the menace of the Cold War - a world filtered through the imagination of Madeleine McCarthy, a spirited eight-year-old. Unaware that her father, Jack, is caught up in his own web of secrets, she at first welcomes her family's posting to a sleepy air force base in Ontario. But then tradegy strikes, and a local murder intersects with global forces. As tension builds, Jack must decide where his loyalty lies, and Madeleine learns about the ambiguity of human morality - a lesson that will only become clear when the quest for the truth, and the killer, is renewed twenty years later." This was an incredible book that had me in tears at the end. It left me with such a feeling of sadness for this family, although Madeleine says to her Mom, "I'm okey now Mom." I think my sadness was for the parents and how they, especially the father, thought they were keeping their children "safe". It is very thought-provoking politically. So much sadness in the quest for power. It takes a while to get into and builds up slowly, but it is such a good book. Gave book away. Hope someone journals it someday.